This is a treasure, a caravanserai of a book, erudite, personal, enlightening. Pierre Joris poet, translator, editor, anthologist scholar, flâneur par excellence—is an incomparable and friendly guide to these realms, his lifelong passion and esprit manifest and up for the rigor of this vast deserta. At hand a portable delight and piercing explosion of nomadic poetics with forays into prosody (the riḥlas, and the muallaqat, the hanging poems at the Kaaba (black stone) in Mecca, politics (Arab Spring, see Adonis’s comment that Jerusalem is the most “savage city in the world”) and culture (a visit to mystic Fez and its living streets), sprinkled with lambent poems of a range of women throughout. We learn that “troubadour” comes not from “trobare” but from Arabic “tarab” to sing, which suggests a musical poetry that produces an exalted state, and also links to Lorca’s “duende” connecting back to Al-Andalus. Anything that gets to the root is good gnosis in these times where, as with all the rest, the intellectual and spiritual battle seems to be with colonial presumption if not genocide. We examine the “melancholic archeology” of many poets including Adonis, Adbellatif Laabi, Mahmoud Darwish, Mohammed Bennis, Habib Tengour. Reference to western authors thickens the mix: Celan, The Beats, Paul Bowles, Charles Olson. If you were someone involved with literary infrastructure, bringing poets and writers of Arabic origin to the US after 9/11 was total anathema. Checkpoints were on “brown alert” and Lynne Cheney had her Campus Watch radar out for subversives here and abroad. This obsessive racism sadly continues under today’s US zenophobic policies, only getting worse. 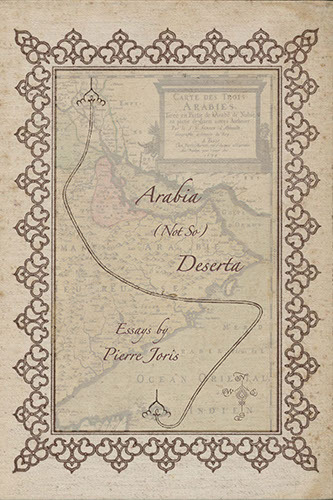 Pierre Joris’s scintillating Arabia is a salient antidote for our Antithesis Reality. Far too few U.S. based poets have had long-term interest and involvement in Arabic culture. 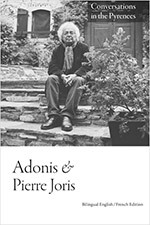 Given that Pierre Joris is one of those few, this collection of essays, translations, ruminations, and encounters provides a timely opportunity to engage with someone whose own poetics have been formed by this immersion and familiarity. This collection traverses decades at the crossroads of political, linguistic, cultural, and experiential collision, collusion, and cooperation, providing readers ready to journey through this terrain much to contemplate and learn about. Adonis & Pierre Joris, Conversations in the Pyrenees (CMP 2018); a translation of Egyptian poet Safaa Fathy’s Revolution Goes Through Walls (SplitLevel, 2018), The Book of U /Le livre des cormorans (poems; with Nicole Peyrafitte, 2017); The Agony of I.B. (a play 2016); An American Suite (early poems; inpatient press 2016); Barzakh: Poems 2000-2012 (Black Widow Press 2014); Breathturn into Timestead: The Collected Later Poetry of Paul Celan (FSG 2014); A Voice full of Cities: The Collected Essays of Robert Kelly (2014, Contra Mundum Press) & The University of California Book of North African Literature (volume 4 in the Poems for the Millennium series, coedited with Habib Tengour, 2012). Forthcoming are the two final volumes of his Paul Celan translations, Microliths (Posthumous prose) from Contra Mundum Press (2019), The Collected Earlier Poetry (FSG 2020), & A City Full of Voices: Essays on Robert Kelly ( 2019) as well as a Pierre Joris Reader (BWP, 2020).